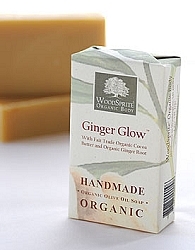 Inspired by our popular sea salt glow of the same name, our spicy blend of ginger and other pure essential oils is sure to lighten your heart with its firefly warmth. Rich lather and emollient marshmallow root soothe dry winter skin. Hand-wrapped in 100% Post Consumer Recycled paper. 4 oz.